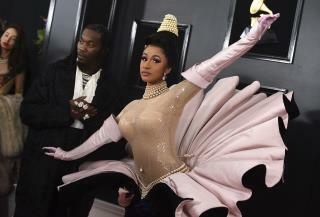 (Newser) – Ariana Grande won her first Grammy Award on Sunday, but the singer didn't collect it after deciding to skip the ceremony following a public dispute with the show's producer. Grande won the best pop vocal album trophy for "Sweetener," beating Taylor Swift, Kelly Clarkson, Pink, Shawn Mendes, and Camila Cabello. Grande was not in attendance at the pre-telecast ceremony, but she wrote on Twitter that her win was "wild and beautiful," the AP reports. "I know I'm not there tonight," she tweeted. "Trust, I tried and still truly wished it had worked." Grande accused Grammy telecast executive producer Ken Ehrlich of lying about discussions with the superstar singer about performing at Sunday's ceremony. I forgot they were on.